Remember when creating animations used to cost an absolute bomb? When only skilled animators could create a short 30-second explainer video? Thankfully, technology has changed for the better. What used to be a complicated process, is now a smooth and enjoyable experience, and that’s thanks to the many different free video animation makers available out there. So how do you decide which application to use? How do you know which animation maker best suits your requirements? Not everyone has the time to try out different platforms, which is why we have done it for you. We put our own platform at the top of the pile for a reason. Before we tell you why Moovly is number one, here is a little about our animation platform. Moovly is an online video animation maker which is entirely cloud-based. No need to download any software. All that is required is a working browser and an internet connection, and you can get started on creating animations in no time. Now that you have the basics, what makes Moovly our top pick? For starters, Moovly has unique graphical Libraries with over 1 million media assets, including stock videos, motion graphics, music, sound effects, photos and illustrations, all royalty free and free for you to include in your videos! Unlike most of the other top video animation makers that feature on this blog, Moovly offers a full-featured Free Trial license. Sign up for free and immediately start working on your animated video, it’s that easy! Next up on our list is PowToon. Similar to Moovly, PowToon offers different licenses, including a limited Free License, a Pro and a Business license. One of PowToon’s features that distinguish itself from the other video animation makers on our list, is the option to choose between Presentation mode and Animation mode. If you are already familiar with Powtoon, but looking for an alternative, don’t worry, we have you covered. Third, on our list, we have GoAnimate. Just Like PowToon and Moovly, GoAnimate is an entirely cloud-based platform, committed to creating cartoons. One of GoAnimate’s stand out features is the ability to add lip-sync to your chosen characters by adding a voice recording or importing an audio file. GoAnimate does not have a free license, but rather a 14-day premium trial for you to try out their platform. Animaker is another animation maker that lets you create animations in an efficient manner. With Animaker, you can choose a pre-made presentation template and add text to each of your slides. Although you do have less choice when using Animaker, it effectively lets you make colorful cartoon videos in a short period. Animaker is the ideal video animation maker if you just want to create an animated video, but aren’t too fussed about customizing the video plot. Wideo is one of the most user-friendly content creation platforms on the market today. Wideo is a great video animation platform with a well-suited focus on businesses. With Wideo, you have access to a range of pre-animated templates, all of which are gracefully designed. The only downside however is that you can only create free animations of up to 30 seconds long. Anything longer will require you to upgrade to a paid license. With Voki, you can create animations with a particular focus on education. Unlike the other video animation makers above, Voki doesn’t allow you to create an animated video from scratch. Instead, it allows you to create customized avatars and add voice overs. Last but not least is Explee, which focuses on one blank template. Don’t let its simplicity fool you, though; it’s enough to create engaging and direct video presentations. If you are looking to create whiteboard animations, then this may be the content creation platform for you. Explee is ideal for video animators who don’t care too much about design quality but rather need something both professional and fast. Like GoAnimate, Explee offers a 14-day free trial, which gives you a taster on how to create animations. 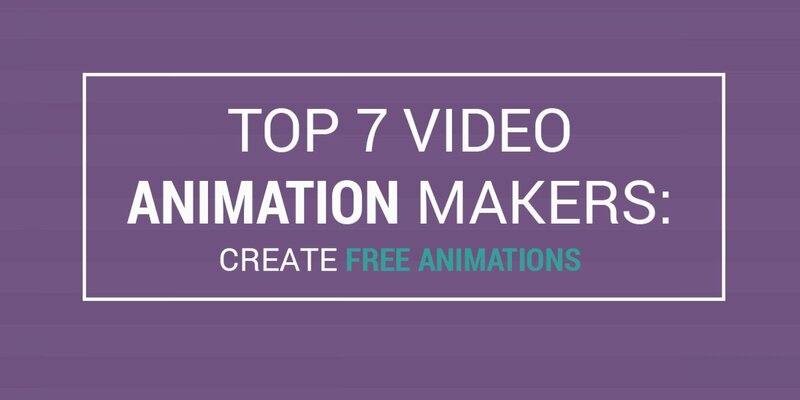 That sums up our list of the top 7 video animation makers for you to create your free animations. Should you choose our number one pick, we have put together a little video playlist to help you get started and guide you through the platform.